Arbor Day came a little late to the San Juans, nevertheless it was celebrated with a tree giveaway. Three Granges in San Juan County partnered in the project to distribute 500 trees. 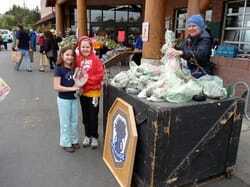 Members of Friday Harbor Grange 225, Orcas Grange 964, and Lopez Grange 1060 each devoted their Saturday to giving away the tree seedlings to shoppers at the local markets on the three islands. The Scotch pines were donated by Evans Nursery on Orcas Island for the event. On San Juan Island, 300 trees were distributed, Orcas Island Grange and Lopez Island Grange each gave away 100 of the trees. 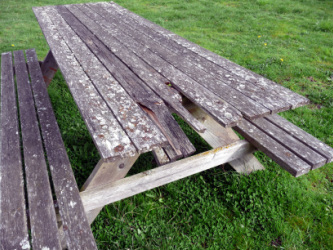 Friday Harbor Grange members saw the need for new picnic tables at the San Juan Island Historical Museum. The old tables were in terrible repair. So we began a campaign to replace the old tables with new ones built by Grange volunteers. Our goal is to provide ten new tables for the Historical Museum. As of September 2013, we have built four of the tables. Santa Island is organized by Glenda Edwards and J.B. Herren. Santa visits San Juan Island on the Saturday before Christmas. Children are welcome to come and sit on Santa's lap to tell him their Christmas wishes. Parents and children are treated to cookies and hot cider. Even the weather pitched in with a sunny day on February 17, 2013 when 65 Sitka Spruce were planted by volunteers from Friday Harbor Grange 225. The spruce trees were remnants from last year’s Arbor Day bare root tree give-away that had been potted and nurtured by FH Grange member Alex Gavora. The new tree-lined drive is a fitting memorial to her sister Pauli Gavora who lost her battle with cancer in 2012. Pauli was the inspiration behind San Juan's Island’s recognition of Arbor Day for many years.